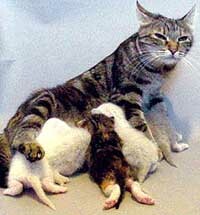 Ovariohysterectomy is the medical term for spaying a female cat. Ovariohysterectomy is best performed on kittens and young cats. If necessary, the surgery can be performed at a very early age without any noticeable side effects. Though ovariohysterectomies can be performed at any age, the surgery is much less complicated and there are fewer risks when the animal is young. Even though a spay is considered routine surgery, there is nothing routine about any abdominal surgery performed under general anesthesia. Ovariohysterectomies are major abdominal procedures, especially when performed on older cats that have had several heat cycles or have had kittens. Having your female cat spayed is an obligation that comes with pet ownership. All humane organizations, animal shelters and veterinarians promote the concept of pet population control by having dogs and cats spayed and neutered. The cost of a cat spay is inexpensive, especially when one considers what is involved.